Recombinant fragment corresponding to Human SDF1 aa 22-89. 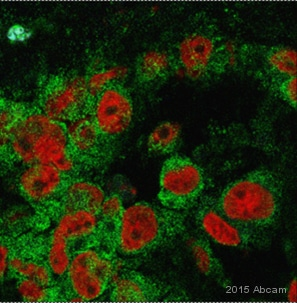 Recombinant human SDF1 protein (ab9798) can be used as a positive control in WB. Our Abpromise guarantee covers the use of ab9797 in the following tested applications. Neutralising Use at an assay dependent dilution. To yield one-half maximal inhibition [ND50] of the biological activity of hSDF1 alpha (100 ng/ml), a concentration of 2-4 µg/ml of this antibody is required. Indirect ELISA Use a concentration of 0.5 - 2 µg/ml. (using 100 µl/well antibody solution). This antigen affinity purified antibody, in conjunction with compatible secondary reagents, allows the detection of at least 0.2 - 0.4 ng/well of recombinant Human SDF1 alpha. Sandwich ELISA Use a concentration of 0.5 - 2 µg/ml. Can be paired for Sandwich ELISA with Rabbit polyclonal to SDF1 (Biotin) (ab84277). (using 100 µl/well antibody solution). This antigen affinity purified antibody, in conjunction with ab84277 as a detection antibody, allows the detection of at least 0.2 - 0.4 ng/well of recombinant Human SDF1 alpha. WB Use at an assay dependent concentration. To detect hSDF-1a by Western Blot analysis this antibody can be used at a concentration of 0.1 - 0.2 µg/ml. Used in conjunction with compatible secondary reagents the detection limit for recombinant hSDF-1a is 1.5 - 3.0 ng/lane, under either reducing or non-reducing conditions. ELISA Use at an assay dependent concentration. To detect hSDF-1a by direct ELISA (using 100µl/well antibody solution) a concentration of at least 0.5µg/ml of this antibody is required. This antigen affinity purified antibody, in conjunction with compatible secondary reagents, allows the detection of 0.2 - 0.4 ng/well of recombinant hSDF-1a. Chemoattractant active on T-lymphocytes, monocytes, but not neutrophils. Activates the C-X-C chemokine receptor CXCR4 to induce a rapid and transient rise in the level of intracellular calcium ions and chemotaxis. Also binds to atypical chemokine receptor ACKR3, which activates the beta-arrestin pathway and acts as a scavenger receptor for SDF-1. SDF-1-beta(3-72) and SDF-1-alpha(3-67) show a reduced chemotactic activity. Binding to cell surface proteoglycans seems to inhibit formation of SDF-1-alpha(3-67) and thus to preserve activity on local sites. Acts as a positive regulator of monocyte migration and a negative regulator of monocyte adhesion via the LYN kinase. Stimulates migration of monocytes and T-lymphocytes through its receptors, CXCR4 and ACKR3, and decreases monocyte adherence to surfaces coated with ICAM-1, a ligand for beta-2 integrins. SDF1A/CXCR4 signaling axis inhibits beta-2 integrin LFA-1 mediated adhesion of monocytes to ICAM-1 through LYN kinase. Inhibits CXCR4-mediated infection by T-cell line-adapted HIV-1. Plays a protective role after myocardial infarction. Induces down-regulation and internalization of ACKR3 expressed in various cells. Has several critical functions during embryonic development; required for B-cell lymphopoiesis, myelopoiesis in bone marrow and heart ventricular septum formation. Isoform Alpha and isoform Beta are ubiquitously expressed, with highest levels detected in liver, pancreas and spleen. Isoform Gamma is mainly expressed in heart, with weak expression detected in several other tissues. Isoform Delta, isoform Epsilon and isoform Theta have highest expression levels in pancreas, with lower levels detected in heart, kidney, liver and spleen. Isoform Alpha is ubiquitously expressed in fetal tissues. Isoform Beta and isoform Delta have more limited expression patterns, with highest levels detected in fetal spleen and fetal liver, respectively. Isoform Gamma and isoform Theta are weakly detected in fetal kidney. Processed forms SDF-1-beta(3-72) and SDF-1-alpha(3-67) are produced after secretion by proteolytic cleavage of isoforms Beta and Alpha, respectively. The N-terminal processing is probably achieved by DPP4. Isoform Alpha is first cleaved at the C-terminus to yield a SDF-1-alpha(1-67) intermediate before being processed at the N-terminus. The C-terminal processing of isoform Alpha is reduced by binding to heparin and, probably, cell surface proteoglycans. 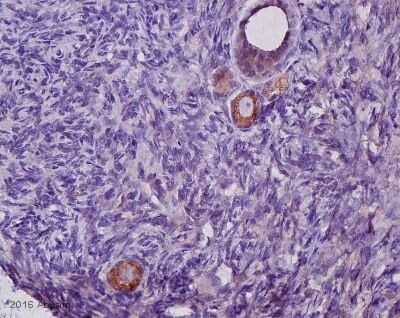 ab9797 staining SDF1 alpha in human colorectal adenocarcinoma tissue by Immunohistochemistry (Formalin/PFA fixed paraffin-embedded sections). Tissue underwent heat mediated antigen retrieval in sodium citrate buffer (pH 6.0). The primary antibody was used at 0.5 ug/ml and incubated with sample at 4°C overnight. A HRP-labeled polymer detection system was used with a DAB chromogen. Immunocytochemistry/ Immunofluorescence - Anti-SDF1 antibody (ab9797)Image from Griffin M et al., PLoS One. 2011;6(8):e23404. Epub 2011 Aug 16. Fig 7.; doi:10.1371/journal.pone.0023404; August 16, 2011, PLoS ONE 6(8): e23404. Immunocytochemistry/ Immunofluorescence analysis of Human bone marrow mesenchymal stem cells staining SDF1 alpha (green) using ab9797. Cells were either unstimulated (right) or stimulated with direct current (left) before being fixed in formalin and permeabilized in 0.1% Triton X-100 in PBS. Samples were incubated with primary antibody (1/200 in PBS) and an AlexaFluor®488-conjugated anti-rabbit polyclonal IgG (1/200) was used as the secondary antibody. Immunohistochemistry (Formalin/PFA-fixed paraffin-embedded sections) - Anti-SDF1 antibody (ab9797)This image is courtesy of an Abreview submitted by Ana Paula Ribeiro Rodrigues. 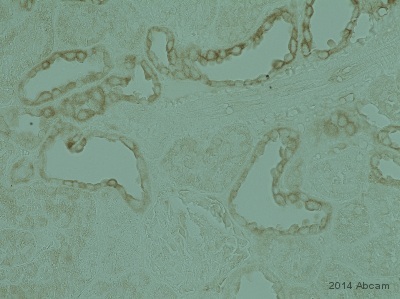 Immunohistochemical analysis of goat ovary tissue section, labelling SDF1 with ab9797. Samples were fixed in paraformaldhehyde, heat mediated antigen retrieval was performed with Citrate buffer, blocking was with BSA at 50µg/mL for 1 hour at 25°C. ab9797 was diluted 1/1000 and incubation was for 12 hours at 4°C. 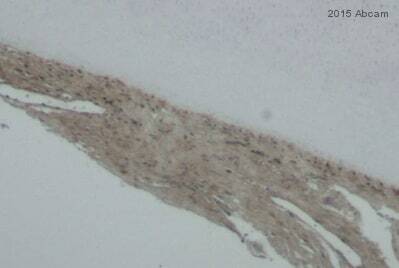 The secondary antibody used was a goat anti-rabbit IgG H+L conjugated to Biotin (ab97049) diluted 1/500. 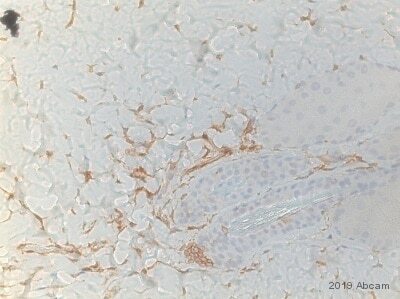 Immunohistochemistry (Frozen sections) - Anti-SDF1 antibody (ab9797)This image is courtesy of an anonymous Abreview. Immunohistochemical analysis of human colon tumour frozen section, labelling SDF1 with ab9797. Section was fixed in formaldehyde, permeabilzation was with 1x PBS with 0.3% triton-x-100, and blocking was with 5% serum for 1 hour at 24°C. ab9797 was diluted 1/1000 and incubation with sample was for 3 hours at 24°C. The secondary used was a Goat anti-Rabbit Alexa Fluor®488-conjugated polyclonal, diluted 1/2000. Nuclei stained red with DRAQ5. 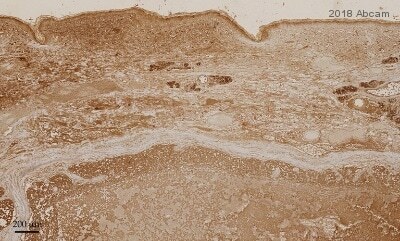 Immunohistochemistry (Frozen sections) - Anti-SDF1 antibody (ab9797)Image courtesy of an anonymous Abreview. 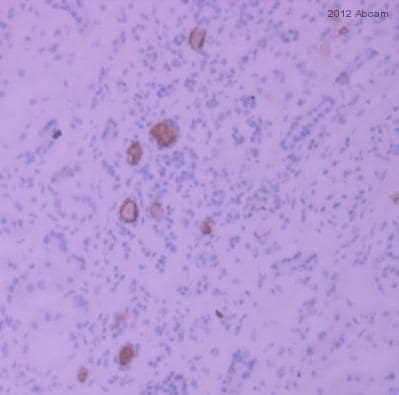 ab9797 staining SDF1 alpha in human kidney tissue by Immunohistochemistry (Frozen sections). The tissue was fixed in acetone, blocked with 10% serum for 20 minutes at 21°C and then incubated with ab9797 at 5µg/ml for 1 hour at 21°C. The secondary used was an undiluted HRP conjugated goat polyclonal.